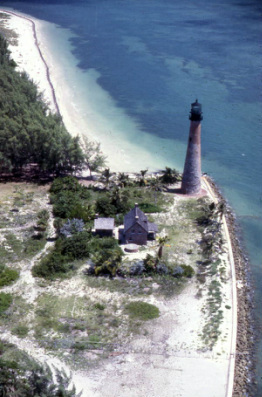 The Cape Florida Lighthouse was built in 1825 on Key Biscayne to protect ships traveling near the treacherous Florida reef, where shipwrecks were so common that settlers and Seminole Indians routinely collected spilled goods in an industry they called "wrecking." After the Second Seminole War broke out in December 1835, Seminoles opened rifle fire on the isolated lighthouse, trapping its new keeper, John Thompson, and his assistant. Thompson fired back as he tried to ward off the attack but by nightfall, the Seminoles reached the base of the lighthouse and set fire to the entrance, doors and windows. The fire ignited cans of oil stored at the base, and soon the entire floor was aflame. As the fire grew up the stairs, the iron floor grew burning hot. Trapped, the keeper and his assistant ran toward the top, and the keeper threw down gunpowder, thinking it would cause a huge explosion and mercifully end their lives. The Indians thought the explosion killed them, burned down the keeper's home and took off in his boat. But the explosion actually put out the fire. While the assistant died, the keeper was still alive but in a terrible state in the watchtower, with no way to climb down. He spent the next 12 hours with his foot nearly shot off, suffering burns, roasting in the hot sun, with nothing to drink and his dead assistant's body next to him. He was finally rescued by a passing ship that had heard the explosion from 12 miles away. The tower was rebuilt in 1846 but put out of commission again by a Confederate raiding party in 1861. The light was extinguished in 1878 when it was replaced by the more powerful Fowey Rocks Lighthouse. It was relit in 1978 and is the centerpiece of the 406-acre Bill Baggs Cape Florida Recreation Area. The lighthouse is the oldest standing structure in South Florida.